Overseas students who intend to take up studies in Germany will need a visa for entry. Germany student visa is necessary under the immigration laws of the country. Exceptions are for student visa applicants from European Union and from states with special agreements: Honduras, Iceland, Monaco, Norway, San Marino, Switzerland, Liechtenstein and the USA. This visa is very similar to Germany student visa and is for overseas students who have applied at a German university (or equivalent) and have received a confirmation letter regarding their admission. Required documents are same as student visa applicant. Overseas students can take this kind of Germany student visa to study and learn German language. Only a few documents like your mark sheets, financial statement, passport and admission letter will be required. Overseas graduates who are planning to complete their postgraduate studies or want to do scientific research in Germany for more than 3 months need to apply for a German student visa. 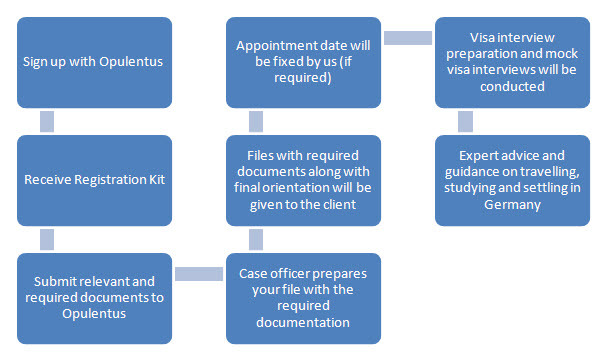 Visa application should have an invitation letter from the university/scientist. In case of absence of salary, you need to demonstrate proof regarding your funds and stay.